In a large bowl or mixer, combine the flour, eggs, sour cream and 1/2 cup of water. Beat the eggs as you mix and gradually add the rest of the water until the mixture is combined. Turn the dough onto a well floured surface. Knead it gently, using a dropping technique (lift the dough from the surface and drop it down). Knead only until the ingredients are blended and the dough is smooth and slightly sticky, about 3 to 5 minutes. Be careful not to over work the dough. Wrap the dough ball in plastic wrap and let it rest for at least 20 to 30 minutes while you prepare the filling. Put the potatoes in a medium pot and add just enough cold, salted water to cover them. Bring to a boil and cook until the potatoes are soft, about 20 minutes. While the potatoes cook, melt the butter and oil over medium heat in a large saute pan. Add the onion, garlic and thyme, cooking until the onion turns translucent, about 2 minutes. Lower the heat and continue cooking until onions caramelize slightly, about 20 minutes. You may need to add a bit more butter as the onion and garlic mixture cooks. Season with salt and pepper to taste and set aside to cool. When the potatoes are soft, drain them in a colander and lightly press out the remaining moisture. Return them to the pot, remove from heat and add the cooled onion mixture and the cheese. Mash them just until blended and large lumps are gone. Season again with salt and pepper to taste. Set aside to cool while you roll out the pierogi dough. Bring a large pot of salted water to a boil over high heat. With lightly floured hands, pinch off tablespoon sized portions of the dough and roll them into balls. The balls should be about 1-1/2 inches in diameter, yielding about 3 dozen total. On a well floured surface, gently roll each ball with a rolling-pin until about 1/8 inch thick and 3-1/2 inches round. Cover the finished rounds with a damp towel so they don’t dry out while you’re working. Once your rounds are rolled out, hold each in the palm of your hand, filling the center of it with a generous tablespoon of the potato mixture. Gently fold the round in half, pulling the edges away and pinching them firmly shut to enclose the filling. Be sure the edges are sealed by working from one end to the other. As you work, set your filled pierogi aside on a floured surface and cover them with plastic wrap. Working in batches, drop no more than 6 pierogi at a time into the boiling water. After they float back to the surface, allow them to cook another 2 to 4 minutes. Remove the pierogi with a slotted spoon and place on a towel to drain and cool. In a large skillet, over medium heat, cook the bacon strips until cooked but still pliable. Remove the bacon and drain on paper towels… then chop. Set aside. Add 1-2 tablespoons of butter to the skillet with the rendered bacon fat. You should have a total of about 3 tablespoons of fat between the butter and the bacon grease. Melt the butter. Add the onions and Kielbasa slices… cook the onions until soft and translucent. Remove the onions an oven safe 9×13 baking dish. Keep them warm in the preheated oven. Continue to cook the Kielbasa slices until browned on both sides. Remove from the pan and drain on paper towels. Add them to the baking dish and return dish to the oven to keep warm until pierogies are done cooking. Add 1-2 tablespoons butter to the skillet. Note: You should have about 3 tablespoons of fat totally in your skillet…. the Kielbasa will render some fat… so depending on the fat from the bacon and the Kielbasa… will determine how much butter you need to add. Add the pierogies to the hot skillet. Cook over medium heat until lightly browned on both sides. Remove from the skillet when they are lightly browned and drain on paper towels. Add the pierogies to the baking dish with the onions and Kielbasa…. Toss lightly to mix. Sprinkle chopped bacon over the top and serve with sour cream on the side. That’s a lot, right! You should never pierogie alone! 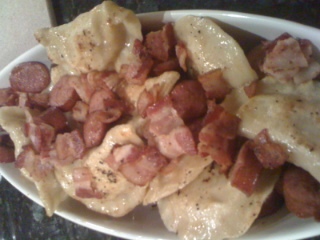 Trust me, I am now convinced that you should have a friend over and a bottle of wine and pierogie together! They were gone within minutes though, they are truly and delightfully yummy! They are my favorite now, too! I need to try your version.